Cruciate rupture, disease or tear is the commonest form of lameness in the hind leg of a dog. If your dog has been diagnosed with this problem then it can be confusing and overwhelming. We see a lot of cruciate cases here at Kelperland and hopefully this page will help. We are happy to see referrals, so if your dog has a cruciate problem and you want some advice then do get in touch. The cruciate ligament is a very important ligament which sits in the middle of a dog’s knee joint, holding the bones around the joint together when the dog puts his foot down. When that ligament becomes diseased, weakens, or simply snaps it causes the bones around the knee joint to ‘wobble’ around when the foot is put down – this ‘instability’ means the dog cannot use that leg normally and becomes lame. The lameness seen can range from severe (i.e. can’t put the foot down at all), to mild (only showing a slight limp on running). The joint will swell up causing significant pain. If this problem goes untreated it is most likely to lead to long standing pain, lameness and then severe arthritis in later life. It is a condition that can affect dogs of any age. The main issue is that when the ligament weakens or snaps it frays, just like when a cut rope frays at the edges, which means it cannot simply be stitched back together – the ligament will never heal and regain the strength required to hold the knee joint together. There are two main choices for treatment – surgery or not. Not operating is a feasible option if your dog weighs less than 10kgs. Studies have shown that little dogs can heal themselves if they are rested extremely strictly – in practice this means living in a small cage for 6 weeks. In little dogs the weight, and therefore the force, running through the damaged joint is significantly less, meaning that the body can sort itself out if rested sufficiently. In our experience this is hard on the dog and you the owner – it is difficult to rest a dog so strictly when we can’t explain to them why we’re doing it. But it is a feasible option – it is cheap and avoids the risks associated with surgery. If we decide to go down this treatment route we will examine the patient regularly, and advise on how to achieve the appropriate amount of rest, administer good pain relief and show you how to perform physiotherapy exercises to help smooth the recovery. In practice we operate on most dogs with cruciate problems. In most cases it is essential, in dogs under 10 kgs (where rest is an option) they start using the leg far quicker if they have had surgery. There are over a hundred reported ways that vets can operate on dogs with cruciate problems. Here at Kelperland we have two main ways. When the cruciate ligament becomes diseased or ruptures the joint becomes unstable. 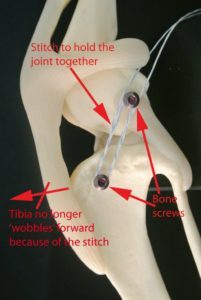 One surgical option is to literally stitch the joint back together, to stop it ‘wobbling’ around. 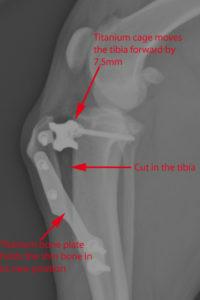 This is achieved by inserting a metal bone screw above and below the joint, and stitching the two screws together. This operation is a very effective way of surgically treating these cases, especially in lighter or less active dogs. 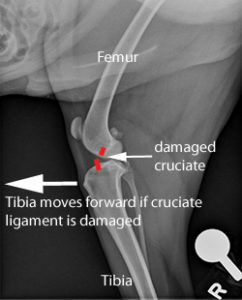 The other main way in which we operate on dogs with cruciate problems is to do a more advanced procedure, a tibial tuberosity advancement. This is a more radical surgical solution to the same problem. The idea with this surgery is to redesign the knee entirely, so that it doesn’t matter anymore than the cruciate ligament is no longer functional. It is all to do with complicated physics, but the idea is to cut into the shin bone (the tibia), and insert a piece of titanium (a cage) into the bone to move the front of the shin bone (the tuberosity) forwards and away from the knee. For each dog there is a measurement which we do, and this works out how far forward we need to move the shin bone. Remarkably, if we move the shin bone by a tiny amount, often less than 1cm, it will change the whole way in which the knee joint functions and then it doesn’t matter that the cruciate ligament doesn’t work anymore. This surgery works very well in the majority of dogs, but is especially useful in active, powerful dogs or larger breeds. Once the bone has been moved a period of strict rest is required to allow the bones to heal in their new position. We normally X-ray the knee again 6 weeks after the operation to ensure that everything is as it should be before we start to do more exercise with the patient. Hopefully this page will have given you some insight into this common problem. If you would like any advice about a cruciate case then do get in touch on 01628 624935 or send us a message, and we’d be happy to discuss your case. Interested in the history of Kelperland Veterinary Centre? Or perhaps you’d like to meet the caring team?